Paul Chesne Testifies in Open Session. Live 2pm performance at Getty Images studios in Los Angeles -- streaming all over the world on the internets. It will stay on the page after being recorded if you can't catch it at the moment. 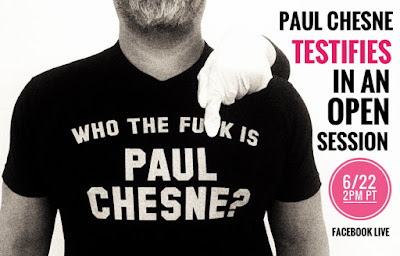 Buy your own "Who The Fu*k Is Paul Chesne?" shirt here!